Watching the Tom and Jerry show live isn't half as fun as watching the animated version on T.V. Especially, when the bickering begins as soon as you open your eyes and you are longing for a peaceful cup of coffee with the day's paper. R and S are surely the human forms of the (in)famous pair. Without the partner in crime, the individual brats languish in quiet boredom. Once the two meet, it is chemical explosion of a different kind. They have to replicate what the other is doing, notwithstanding the collateral damage or the semblance of general peace being shredded around. Added to the mayhem is the echo effect provided by the younger brat repeating every word uttered by the older. Equipped with equal amounts of mischief quotient, one pulls the leg of the other with the sole intention of creating ripples in the otherwise calm atmosphere. The other takes the bait too promptly, as though programmed to perfection, and all hell breaks loose. When they are united, it is tough to keep cool and when they bicker you'd wish that the earth swallowed you up so that there is some silence at least there! Isn't this the exact script of the Tom & Jerry show too? This one has been on my mind for a while too. Tom and Jerry like situations certainly give me hope that there is place for child like emotion at times of distress too. Totally empathis. Got my own Tom n Jerry too. PEace? What's that? ha ha...Got reminded of similar episodes between me and my brother....Sweet post Uma! What would life be without these sibling squabbles huh? 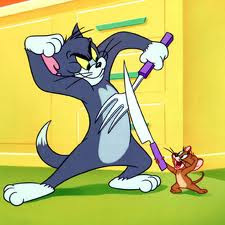 Haha Tom n Jerry too cute! The squabbles between kids are certainly akin to Tom and Jerry show but you do not have the choice to turn it off:) Best wishes for the New Year to you and family! Happy new year to you and your family too, Rahulji!